What kind of first impression is your medical spa making online? Your website makes the difference between your business and competition for many potential customers. Localmize Med Spa website design services combines the aesthetics of design with a revenue-driven approach, that takes online visitors through a sales funnel that ends with them purchasing a treatment package! Your website is an excellent tool for marketing your Med Spa, allowing potential customers to find you and see what makes you stand apart from your competitors. Our carefully crafted website text appeals to both visitors and search engines, while professional web design has given you easy navigation and a consistent theme across all your pages. Our search engine optimization makes your website easy to find on major search engines like Google. Combined with our attractive, user-friendly website interfaces, this design process works to achieve our number one goal: get website visitors to actually come to your spa. Affordable Turnkey Solutions for Med Spa Website Design. Localmize completely redesigned and updated Pura Vida’s website, branding and SEO. We included image galleries to reflect the serene atmosphere of this Omaha med spa. Localmize designed Sculpt’s website, branding and SEO. 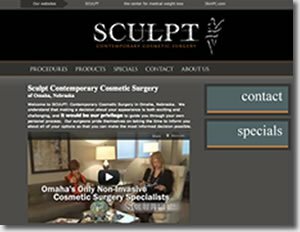 We included pages to highlight their cosmetic surgery specialties and improved the business’s rankings in Google search results. Interested in our online marketing services for med spas? Take a look at our med spa SEO and FAQ page! Want to start building a high quality Med Spa website? Call 877-700-1990 to speak with a Med Spa Website Design expert.